It has been a busy August for London Heathrow Airport. The UK’s only hub airport enjoyed its 22nd consecutive record month of growth as over 7.5 million passengers travelled through Heathrow. Passenger numbers were 2.6% higher than the same time last year, bolstered by the August bank holiday and passengers returning at the end of the summer season. August 2018 was the second busiest month in Heathrow’s history, with 15 separate days where the airport welcomed over 250,000 passengers. 31 August stood out as the busiest day ever for arrivals as 137,303 passengers arrived at Heathrow. Asia saw the biggest increase in passenger numbers (+6.3%), as more passengers flew to and from the region using new services from Hainan Airlines, Tianjin Airlines and Beijing Capital. This was closely followed by North America, up by 4.7%. Cargo volumes grew by 1.2% in August, as 140,738 metrics tonnes of goods made their way through Heathrow to locations across the globe. Cargo growth was led by the US, with over 50,000 metric tonnes travelling to and from the States. 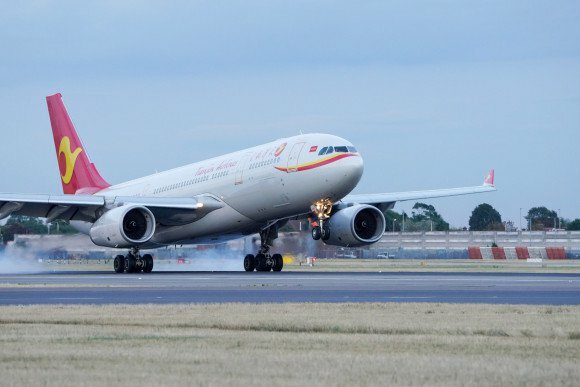 Heathrow welcomed its first flight arriving directly from the Chinese megacity of Chongqing operated by Tianjin Airlines. The route is Heathrow’s 10th direct Chinese connection. This thrice weekly service will be able to transport up to 81,000 passengers a year and 3,744 tonnes of exports annually. The independent Heathrow Skills Taskforce recently published a series of ambitious recommendations that could help the UK capitalise on the tens of thousands of new jobs, apprenticeships and career development opportunities which will be created by the airport’s expansion. Heathrow has revealed the 20 winners of this year’s World of Opportunity Programme. This year’s winners include designers, manufacturers and retailers from across the UK all looking to share their products and expertise with the wider world. The new larger HARRY POTTER™ SHOP in Terminal 5 opened to passengers. The new 1000 sq. Ft. space is nearly double the size of the previous store and offers a selection of items from the popular movie franchise.